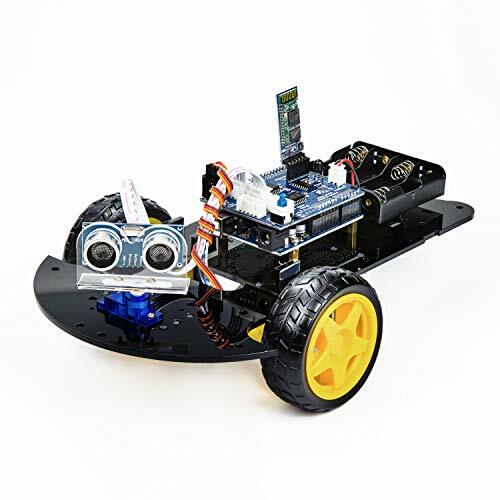 The UCTRONICS Smart Bluetooth Robot Car Kit is a flexible vehicular kit particularly designed for education, competition and entertainment. The kit has an intelligence built in so that it guides itself whenever an obstacle comes ahead of it. An Android APP is provided to connect with the car robot via Bluetooth , easy to control robot. UNO R3 board is a microcontroller board based on the ATmega328P, and fully compatible with Arduino. It has 14 digital input/output pins (of which 6 can be used as PWM outputs), 6 analog inputs, a 16 MHz quartz crystal. Ultrasonic ranging module HC - SR04 provides 2cm - 400cm non-contact measurement function. The module includes ultrasonic transmitters, receiver and control circuit. The shield contains two L293D motor drivers and one 74HC595 shift register. Tiny and lightweight with high output power. Servo can rotate approximately 180 degrees (90 in each direction).